Last month, I made over $3,500 from my Instagram. Before starting @pinlord — the account where I curate and sell enamel pins — I had no experience building a social media or online business. I’m also not an “influencer”, I’m not particularly “social”, and I definitely don’t have a fun and exciting life to show off on Instagram. 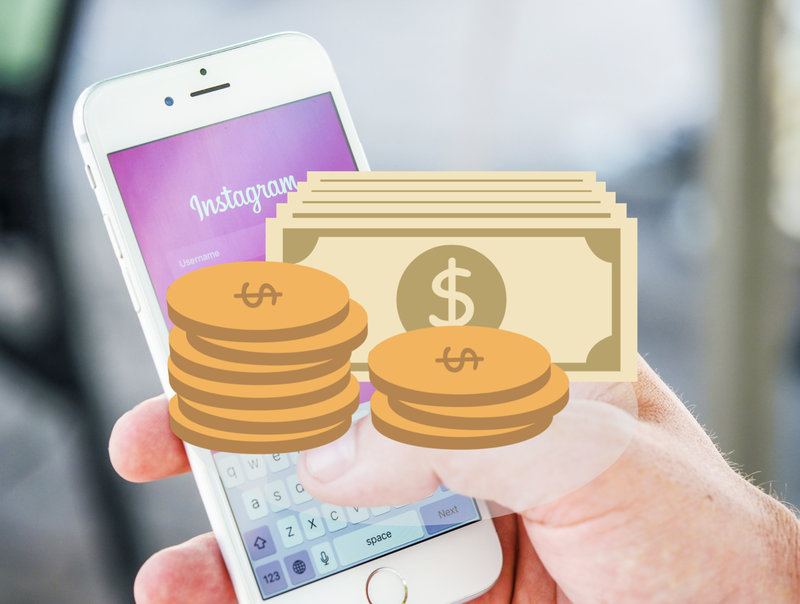 I learned how to monetize my Instagram account by making an effort to understand how the platform works and putting in the work required to execute the right activities at a high level, for a long period of time. Trust me when I say, if I can do it, anyone can! Thing is…there is no “easy money” to be made as a social media content creator or business. Yes, you can earn an income from your Instagram (or Youtube or any other social media platform), but like any other business, success requires consistent and thoughtful work. 1. I solved a problem. Before starting @pinlord, I was first an avid enamel pin-aficionado, spending over $100 a month on pins. It was during this time that I first noticed a problem that I kept coming across when searching for enamel pins on the app — I knew there was the perfect pin for me on Instagram, but because the app doesn’t allow you to search for posts directly, it took a lot of time and energy to sift through dozens of hashtags and profiles to find the pin I would want to buy. How did I solve this problem? I created an account (@pinlord) that featured the best enamel pins on Instagram. By taking the time and energy to comb through dozens of hashtags and accounts to find the most unique/interesting/well designed pins each day, I made it fun and simple (and aesthetically pleasing) for anyone to go to one page and find the best pins to buy on the platform. 2. When I started, @pinlord was highly differentiated within a content category that had a relatively small number of similar accounts. At the time I launched my account (in the summer of 2015), there were less than 5 enamel pin reposters, and none of them took the time and effort to curate an eye-catching, clean grid like I did. Looking back, I now realize that that was the main reason why I was able to build a large and engaged following fast — because I was highly differentiated within a content category with a relatively small number of similar accounts. Not because I held any special Instagram skills or knowledge. Unless you’re a world-class content creator, how fast you’re able to build a large and engaged following not only depends on how you use Instagram, but more importantly, on the number of similar accounts within your content category and how differentiated you are from them. 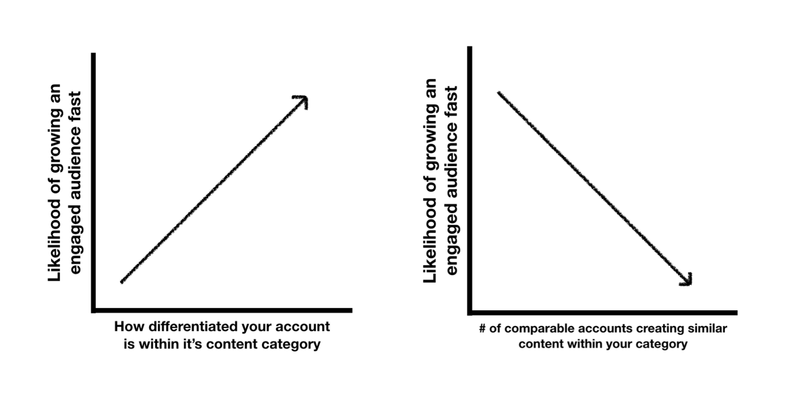 The smaller the number of accounts (and the more differentiated you are) the higher the likelihood is that you’ll be able to gain a valuable audience fast, simply because you’re competing with less accounts for people’s attention. If I were to start @pinlord today, my chances of building the same business from it would be slim and none because it would be very difficult for me to be differentiated within a content category (the enamel pin community) which now has hundreds of accounts competing for the same audience and creating similar content. When I began, we were only a handful. If you’re looking to start an Instagram account with the purpose of making money, first make sure you’re creating a highly differentiated account within a content niche that has a small number of accounts doing something similar to you. Like any other business, the less competition you have, the more likely you are to build a long term viable income. 3. 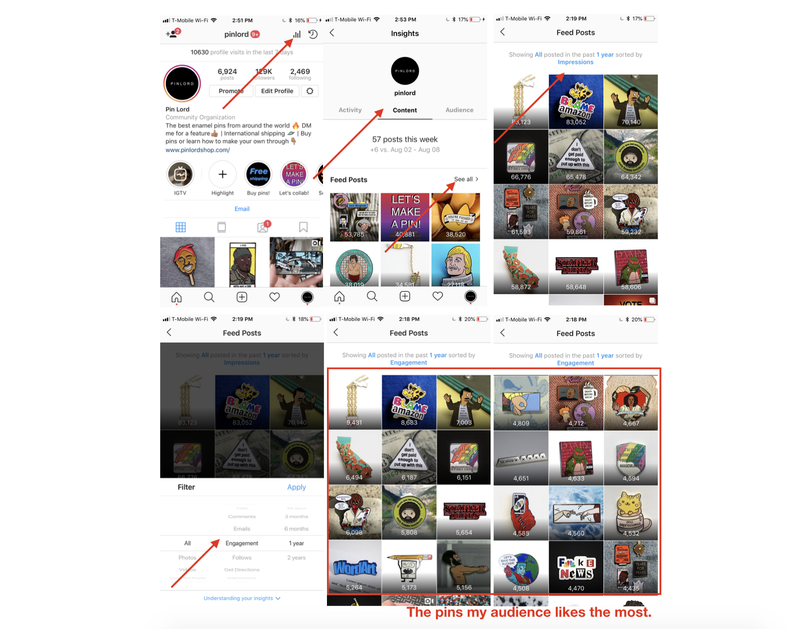 I made an effort to understand how the Instagram platform worked and I used third-party tools to “growth hack” my account. 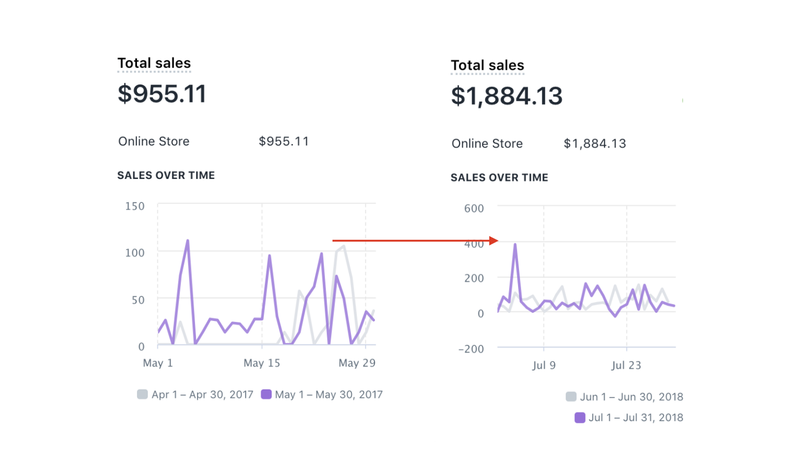 Around a year after starting @pinlord, Instagram changed its algorithm and for the first time, my growth rates and income began to plateau. That’s when I realized that creating a highly differentiated account within a content niche with a small number of similar competitors wasn’t enough to succeed long-term. With the constant instability and audience fluctuations that came from Instagram’s frequent algorithm changes, how much money I could make from my account began to depend more on having a deeper understanding of how the platform worked and how well I was able to execute the activities that grew my audience and engagement faster than the average account. In other words, I had to learn how to “growth hack” my account in order to reach more people than other accounts similar to mine. To do that, I started testing new content and activities as frequently as I could — always measuring the results to understand what impact they had on my growth. The activities that helped me grow faster, I kept doing. The ones that didn’t, I stopped. I also made an effort to find third party Instagram tools that could help me be more effective and efficient with the activities that helped me grow faster (because managing an Instagram can be A LOT of work if you’re not efficient). Creating a visually differentiated grid and automating the process of posting at least twice a day though Onlypult. Automating the liking of posts from accounts that might like my content. This helped me maximize the number of people discovering @pinlord through their activity feed. Gifting pins to Instagram accounts with the highest followers and engagement I could find. This helped me maximize the number of accounts discovering @pinlord through photo tags from other account with valuable audiences. Using my engagement data from Instagram insights to understand what content my audience liked the most, and using that information to create better content more often. I also used engagement data to pay for sponsored posts that helped me grow much faster and sell more products. The better I became at executing these activities, the faster I grew, the more engagement my posts got, and the more income I made. 4. Because I know how to grow a large and engaged audience, I was able to make money from sponsored posts. Also around the 1 year mark, I hit 35K followers and began advertising that people could request a feature on my page by placing a “DM me for a feature” prompt in my bio. I started receiving requests from smaller pin-makers asking me to repost their pin designs so they could be discovered by a larger audience than they could reach by themselves. As my followers and engagement grew, so did the number of requests I got. 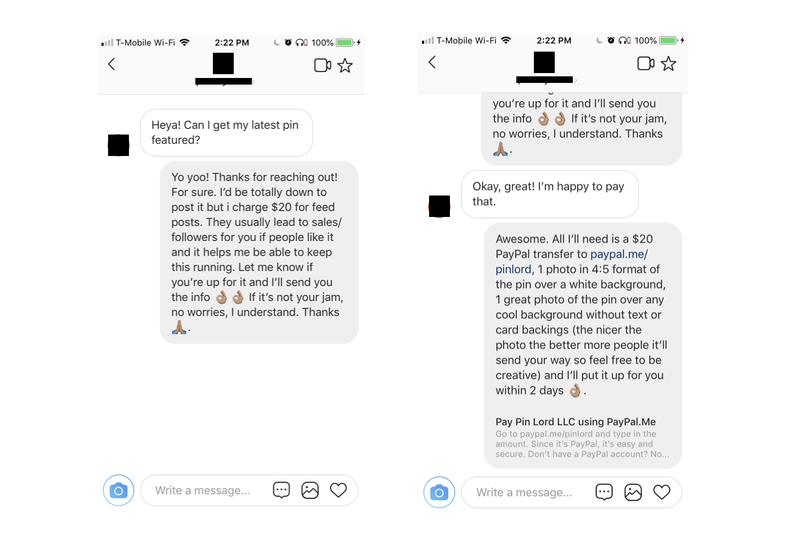 Whenever I featured a pin maker, they usually received value by getting new followers and sales, and most of them returned to ask for another feature. There was a demand for my service and this allowed me to start charging money for a feature. At 35K followers I charged $5, at 50K followers I charged $10, at 75K I charged $15 and at over 100K I now charge $20. At an average of 2.5 sponsored posts a day at $20 each for 30 days, I end up making around $1500 per month, with zero costs. 5. To give as much value possible, I price my sponsored posts based on what other accounts similar to mine charge for a comparable service. When it came to pricing, I’ve had to determine the amount I charge based on what comparable accounts were charging for a repost (because that’s who my potential customers would compare my prices with). For example, if @patchgame (an account comparable to mine) has 200K followers, 1% engagement, and was charging $40 for a repost, I would charge $20 for a repost since I have 100K followers and 1.5% engagement. People compare our follower and engagement numbers, and gauge which price has more value based those metrics. The more value my customers (people I featured) receive, the more likely they are to return for my services and the more likely I am to build a sustainable, long term business. 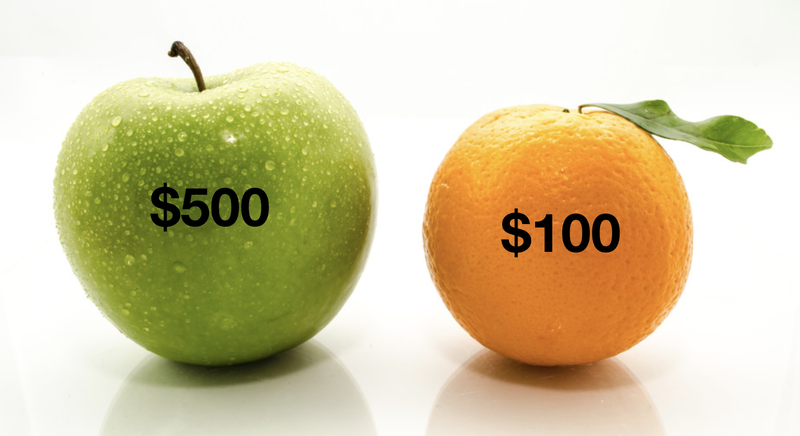 It’s important to know who your customers compare you with when it comes to obtaining a similar service because then you’ll be able to get set your pricing to maximize value (and repeat customers). This limitation to pricing is another reason why it’s so important to be highly differentiated within a content category. Unless you are the account within your category that has the largest and most engaged following (which is very difficult with millions of people on Instagram), you’ll always have to price your posts based on what other comparable accounts are charging for a similar service. 6. I made paying for sponsored posts as transparent, reliable, simple and quick as possible. For payments, it has always been very important for me to use the most reliable and widely accepted payment provider. For now, that’s paypal (because who the hell wants to give their credit card info to a random person from an Instagram account?!). To make the process quick and simple, I also created a paypal.me link so people could just enter the amount and pay directly from their browser. In case you’re interested, here’s how you make a paypal.me account. A helpful tip is to think about the URL handle you create, because you won’t be able to change it in the future. In my opinion, it’s best if you make it something broad in case you want to use it to receive payments for other businesses in the future. I made the mistake of naming it paypal.me/pinlord and later couldn’t use it for other unrelated businesses because it had such a enamel pin-specific name. Using text replacement to streamline the process helps me to be able to respond to dozens of messages quickly, without having to spend all day on my phone writing out the same thing. 7. Conversely, I’ve also made the mistake of promoting products and services that don’t give my audience value, because they paid well. Earning money from sponsored posts isn’t always the best option for a long term business. People follow my page because I provide value by featuring the best enamel pins from around the world, but at one point in mid 2017, I was featuring at least 2 pins per day that weren’t great. I was posting them because they were a way to get paid a little extra (and I had rent to pay…). Over the 3 month period that I was frequently posting low-value paid content, my engagement dropped from around 3% to 1.5%. As this paid content was not providing as much value to my audience, they engaged with my posts much less. And over time, the more low-quality paid content I featured, the more my audience lost interest because I wasn’t actually featuring the best pins (the reason why they’d originally followed me). My engagement rates went down, lowering the long term value of my account because a much lower percentage of my audience took action whenever I recommended a product or service, or sold something = less customers for myself and for the people I featured. It’s a pit fall a lot of paid content creators fall in, and I did too. Ever since I noticed the decline in engagement during that time, I’ve made an effort to keep the number of low-quality paid posts to a minimum. Although that means a slightly lower monthly income right now, I am creating an overall higher value for my business in the future because my audience believes that the content I post is sincere. So, if you’re thinking about monetizing your Instagram through paid posts, I’d highly recommend that you avoid posting low-quality content, just because the pay is great. Believe me, your business will suffer in the long term because your audience will stop trusting (and caring) about what you say. Also around the 1 year mark, I was getting over 8000 weekly profile visits from people interested in enamel pins, so I decided to begin selling my own pin designs directly through my link in bio. In case you’re interested, I use Shopify. Although it takes a bit of time to get familiar with the platform, once you’re set up it’s super simple to manage and it has the most robust group of 3rd party applications that help you ship simply and cheaply. At first, I made and released the pins that I wanted to see in the world and they sold great. But as the #pingame grew more popular and pin makers started making more money, more people began selling pins on Instagram and it became a highly competitive market. Thousands of new enamel pin options were available to the public and it became much harder for your average enamel pin to sell the quantities it had when there were only a few enamel pin sellers on Instagram. This is a common theme with most product categories sold through Instagram. Through trial and error, I learned that the two main keys to successful pin sales in this environment were: 1) coming up with designs people truly loved (because mediocre products don’t sell well in a competitive market) and 2) releasing new designs as often as possible (so people had a reason to come back and check my site frequently). Knowing that I had to release a great new design at least once a week to increase my sales, but not having the creative juice to do that consistently (I stopped kidding myself that I was that creative), I began using the engagement data from my Instagram Insights to understand what types of pins people had responded to the most positively. To get engagement data go to Instagram Insights, then hit the Content tab, then enter the Feed Posts section and sort by Engagement over the last year. The posts that show up at the top of this grid are the ones that people engaged with the most. Although not perfect, this information helped me create successful designs more often because I had a data-based approach to understanding what type of designs, themes, colors, shapes etc, people already loved. Data made up for my limitations as a designer (because I’m not one) and, by streamlining the production process with my factory, I was able to consistently release relatively-successful new designs once a week. Being able to do this had a positive effect and I saw my sales almost double from an average of around $900 per month to $1800 per month. With production and sales costs at around 33%, that turns out to be close to $1188 of profit per month. 9. I listed my products on marketplace platforms with an in-built audience to make extra money. Once I was releasing 1 new pin per week through my website, I also listed all of my products on Etsy and Depop. These platforms have built-in audiences that are actively looking to buy products similar to mine and, since they don’t require much work to maintain, I was able to sell a few dozen extra products per month, for almost no effort or money. 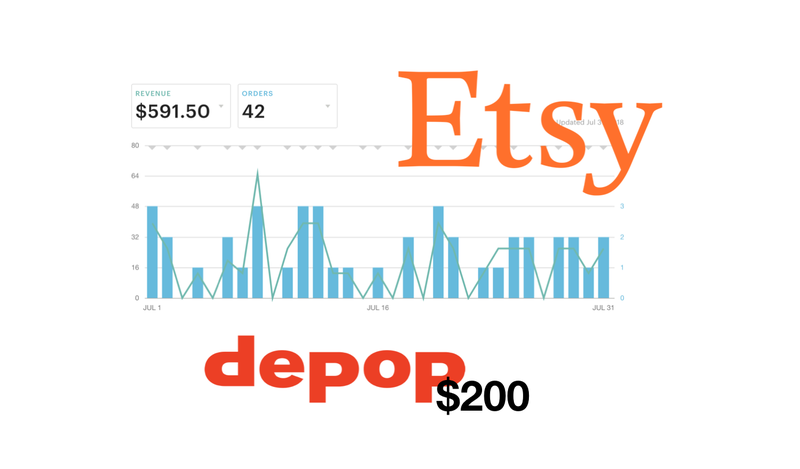 On Etsy I sell an average of around $500 and on Depop around $200 per month. With production costs removed, sales from these platforms amount to an additional profit close to $475 per month. Btw, an effective and simple way to make extra money on your Etsy is to do paid ads. This is the video that showed me how to do it. 10. To find new revenue streams, I constantly test different projects and measure the results. I used my knowledge in the pin making process to write blog posts (and videos) that explain how people can find the right pin factories, make their own pins, sell them, package & ship them and market them on Instagram, as well as how to grow their Instagram. The article about finding the right factories ranks #1 on Google for the topic and I’m able to make around $400 per month from the referrals directed to the factories I use and recommend in the article. I participate in enamel pin expos whenever I can and usually make around $500 per convention. 11. It all ads up! Adding up all of the activities: $1500 from sponsored posts + $1188 from direct sales + $475 from Etsy & Depop + $400 from referrals from my articles = I make around $3500 per month from my Instagram. Although the number seems small in comparison to what Instagram influencers make, earning it isn’t a full time job and that allows me to spend my time doing other things I enjoy (and I also don’t have to get a Job). It’s a lifestyle that’s accessible to anyone who’s willing to make an effort to understand how the platform works and put in the work required to execute the right activities at a high level for a long period of time. If it’s something that interests you, I hope this article provides some insight on how you can do it for yourself, in whatever topic you’re passionate about! Thanks so much for taking the time to read my article! If you enjoyed reading it, you can support me by giving this article a bunch of claps and reading my other Instagram-related articles ❤ If you have any particular topics you’d like me to write about, or if you just want to say hi, feel free to email me at eduardomorales.ny@gmail.com. I always love hearing from my readers!